The beauty about Chandigarh is not just in the fact that the city is so well organised but also what lies inside the city. The marvelous monuments which are nothing but architectural master pieces, the gorgeous gardens, the calm and serene Sukhna Lake, the stunning Bhakra Nangal Dam, the restaurants and food joints with unbelievingly tasty and lip smacking food, the renowned market of Sector-17. Each and every destination is a labyrinth in itself and until and unless you have discovered each and every nook and corner, the journey will always be incomplete. We start our walk from the Open hand monument, which is often wrongly considered as merely a sign and signature of the city of Chandigarh, The Open Hand Monument is actually much more than just that. Le Corbusier, a designer from France used such details and philosophy behind this that men are still puzzled about its actual meaning. The Open Hand Monument stands gracefully in the Sector 1 Area of the city. Our next stop the Leisure valley a continuum of various theme gardens to take “Care of the Body and Spirit” of the city. Le Corbusier retained the eroded valley of a seasonal rivulet (‘City Map’ ) on the original site of the city and sculpted it into a linear park, now over 8 kilometers long, running through the whole of Chandigarh. 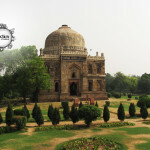 It traverses the heart of the city and has been developed into a series of special “theme gardens” weaving a garland of gardens for the city : of varied hues, textures and colours. Enter this Leisure Valley, and the proximity of the city becomes a blur. Let us walk you through this meandering parkland.